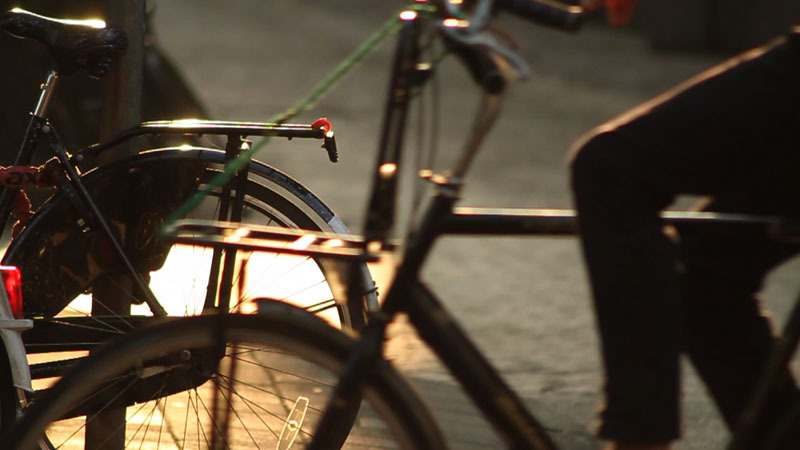 In Dutch, a bicycle is called a fiets, and nobody is quite sure why. I’m one of maybe twelve Amsterdammers who don’t ride a fiets, so in this bit I will just pass on some advice given to me by my many fietser friends. If you’re new to urban cycling in Amsterdam, they say you should start by riding not in the center of town, but in the more leisurely neighborhoods surrounding it. Cycling in the center has a certain intensity and vibe to it that you need to acquire. Once you get where you’re going, what do you do with your bike? You’ll notice designated bike-parking spots with bike racks, and some people even use them. Many others just lock their bike wherever they are, to some fixed object like a bridge railing, or to its own back wheel. Outside busy shops and bars you’ll often find so many bicycles that the sidewalk is impassable. If you see a sign saying geen fietsen plaatsen or rijwielen worden verwijderd, that’s somebody imploring you not to park your bike there. Wrongly parked bicycles  including the thousands of abandoned wrecks  do sometimes get cut and hauled away by the authorities. Don’t buy a nice new bike. All bikes will eventually get stolen, but a shiny expensive-looking one will get stolen very soon. Amsterdammers tend to favor less attractive used bicycles. They speak fondly of the omafiets, or grandma-bike, which is an older upright style. Second-hand (tweedehands) bicycles can be found through some bike repair shops (fietsenmakkers). There’s also the age-old tradition of ‘buying one from a junky’. I'm not sure what portion of bicycle thieves here really are heroin addicts, but 'junky' and 'bicycle thief' have become nearly synonymous in this respect. There is a peculiar institution of gentle criminality here, where someone steals your bike, then you need a new bike but don’t have much money, and then a slow moving cyclist in the street asks you quietly: "Fiets nodig? Fiets kopen?". And then you buy the bike he has just stolen, and ride it until it gets stolen again, and the circle of life is complete. I’ve been advised that when a stranger offers to sell you a bike, you should first ask “Are you a policeman?” to avoid getting nabbed for receiving stolen property.